Sengoku 15mm Japanese Fantasy II Released! 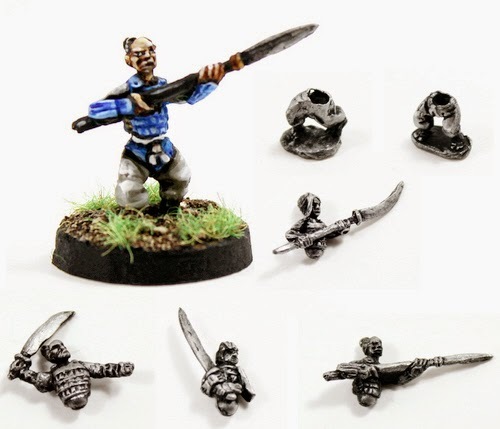 The 15mm Japanese Fantasy miniature range sculpted by John Bell called Sengoku doubles in size today up to forty with the release of the second wave of miniatures. We have Monks, Mikos, Ghosts, Snakes, Spiders, creatures like the Rokurokubi with stretched neck and two part upper and lower bodies to make monsters and warriors. Single pieces, value packs and a full set with saving. There is a lot to this release following up on the Tengu, Oni, Kappa, Goblins and School Girls from the first wave. Read on! Twenty Three Japanese 15mm Fantasy Miniatures - The Full Sengoku II Set! SGF19,SGF20,SGF21,SGF22,SGF23,SGF24,SGF25,SGF26,SGF27,SGF28,SGF29,SGF30,SGF31,SGF32,SGF33,SGF34, SGF35,SGF36,SGF37, SGF38, SGF39 and SGF40 plus one more random Monster Head. The pack offers a small saving off single purchases of those codes. Get one of everything! This pack contains twelve miniatures randomly taken from SGF19, SGF20, SGF21, SGF22 and the pack offers a small saving off single purchases of those codes. This pack contains twelve miniatures randomly taken from SGF23, SGF24, SGF25, SGF26 and the pack offers a small saving off single purchases of those codes. 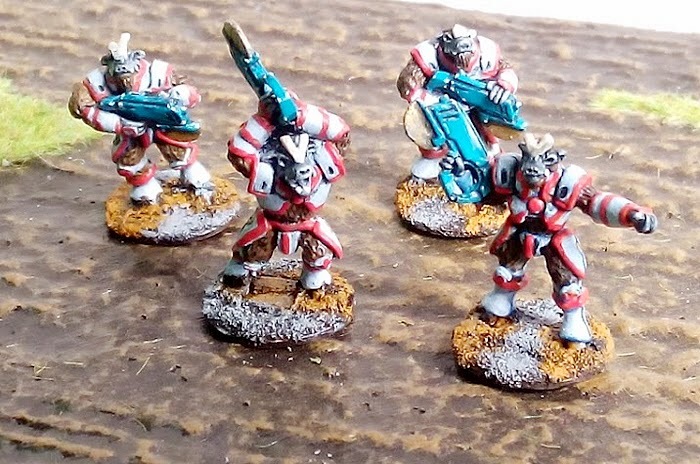 This pack contains six two part miniatures taken equally from SGF28, SGF29 and SGF39, SGF40 and the pack offers a small saving off single purchases of those codes. 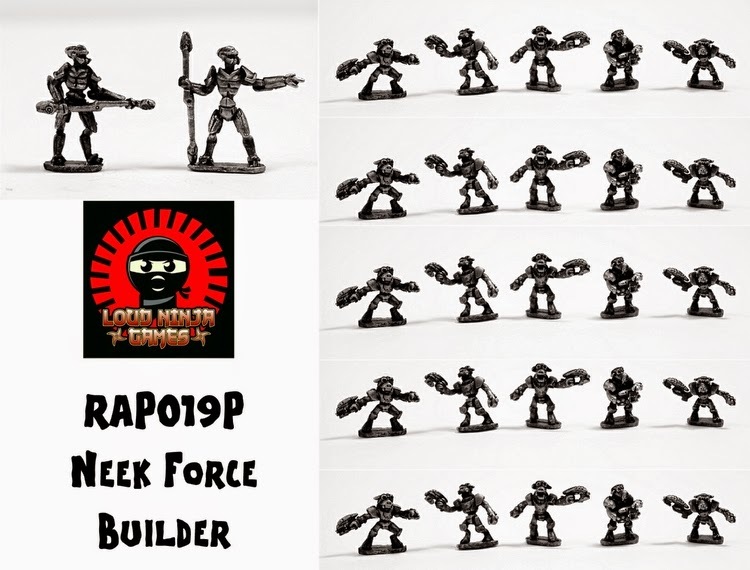 This pack contains six two part miniatures taken equally from SGF30, SGF31, SGF32 and SGF39, SGF40 and the pack offers a small saving off single purchases of those codes. 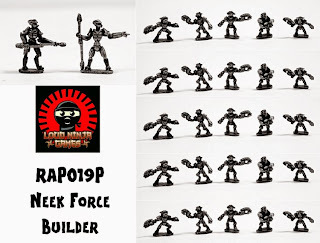 This pack contains twelve two part miniatures taken equally from lower bodies SGF33, SGF34 and upper bodies SGF35, SGF36, SGF37, SGF38 and the pack offers a small saving off single purchases of those codes. Upper and Lower Body halves to make up warriors, humans, spiders, monsters, snakes, centipedes. Lots of choices of assembly! SGF28 Smaller Spider Body. Monster Body for use with any upper body SGF35-40. SGF29 Large Spider Body. Monster Body for use with any upper body SGF35-40. SGF30 Centipede Body. Monster Body for use with any upper body SGF35-40. SGF31 Long Snake Body. Monster Body for use with any upper body SGF35-40. SGF32 Standing Snake Body. Monster Body for use with any upper body SGF35-40. SGF33 Human Legs I. Body for use with upper bodies SGF35-38. SGF34 Human Legs II. Body for use with upper bodies SGF35-38. SGF35 Human Male Upper Body I. Half Armoured with Yari. Use with any lower body SGF28-34. SGF36 Human Female Upper Body I. Half Armoured with Katana. Use with any lower body SGF28-34. SGF37 Human Female Upper Body II. Armoured with Naginata. Use with any lower body SGF28-34. SGF38 Human Male Upper Body II. Armoured with Katana. Use with any lower body SGF28-34. SGF39 Snake Monster Head. Use with a Monster Body SGF28-32. SGF40 Bull Monster Head. Use with a Monster Body SGF28-32. John is currently working on a third wave of Sengoku which will be released later this year. 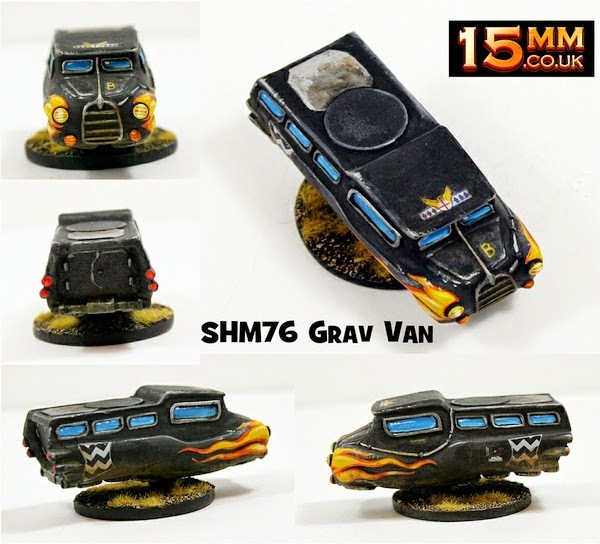 SHM76 Grav Van by Sergio Gonzalez released! 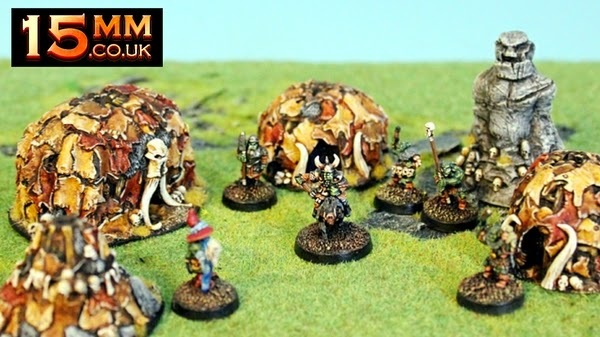 Today 15mm.co.uk welcomes Sergio Gonzalez to the collection of aspiring designers who have chosen to bring their wargaming miniatures to you as part of the SHM Range. A brand new vehicle which marks the first vehicle in the SHM range and also our first 3D printed designer as well. Exciting! 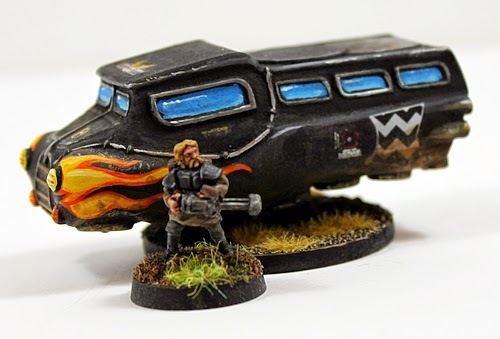 The Grav Van is a highly detailed 15mm scale vehicle which Sergio sees as a cross between a people carrier and a hot rod racer. So it would be excellent for urban use and for rival street gangs to possess. Equally with different paint work it could be a hard working hauler in a densely populated future. This code contains a one piece high quality grey tone resin vehicle in 15mm scale. A Grav Van in a retro futuristic style designed by Sergio Gonzalez. Its dimensions are 65mm long, 28mm wide (at widest point), 25mm tall (at its tallest point). Suitable for use in many settings from near future to space opera and wastelands too. Choose from one pack or three packs with a 10% saving on the drop down product menu. Go HERE. 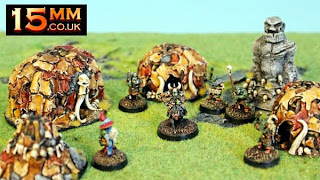 At 15mm.co.uk we are all about fostering wargamers talents and interests and to that end back in 2009 Gavin Syme (GBS) created the SHM idea. 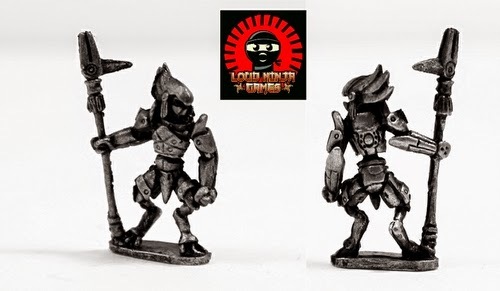 'Self Help Miniatures' are designed by aspiring sculpters who in return for giving their creations to 15mm.co.uk get into the hobby and gain experience. As a result a dozen designers (some of them working on their own right in the industry now) have submitted designs which made it to the SHM Range and this website. If you are keen on seeing what it takes to get into this range then send us an email. 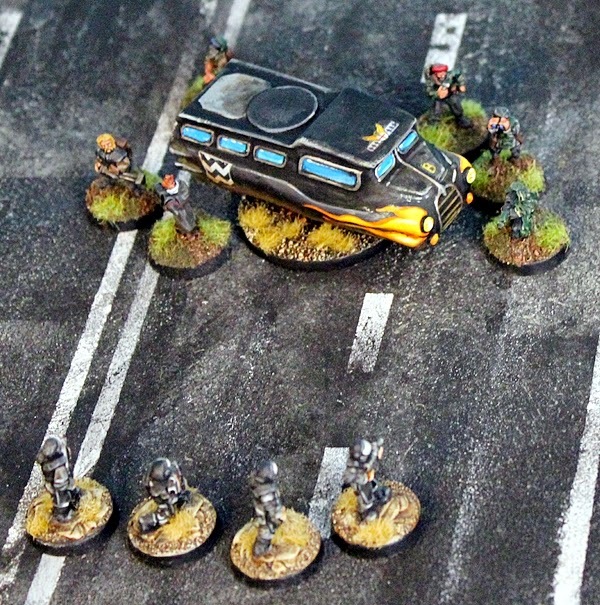 We welcome your approach if you fancy designing figures and vehicles for 15mm scale. There are a great many different and wonderfully unique miniatures in the SHM range which are well worth checking out. Prang, Vergans, Cyborgs, Aliens, Mercenaries, Humans, Creatures, Uhuls, Wildthingians, Horrors and more. Over seventy different sculpts and designs. Go HERE. After our sneak peek at the start of the month a lot of suggestions and guesses of just what the next expansion to our Hordes of Buildings (HOB) 15mm fantasy line would be. Many people got it right. The answer was Orcs! The big and brutal foes of Men, Elves and Dwarfs alike. Following up on our HOB01 Human Starter Settlement we present a pre-order offer on HOB02 Orc Starter Settlement (Set and Single Buildings) open from now until general release on 1st June 2015. All orders containing a HOB02 code will ship on 01.06.15. Go HERE. Lots of you asked for dedicated structures the likes of which have never been created for fantasy wargaming in our scale and we did this and now we expand further! From now until 1st June 2015 we are offering a pre-order deal as follows. Go to our website on the links here and choose your buildings, the set, singles or multiples. You will see that they are 10% off release price for single buildings and 15% off the starter set or a bigger 20% for three starter sets! These prices are on the website you need do nothing but add to your cart. Place one order or as many as you like and we will ship them all out across the world beginning 1st June 2015 making you among the very first to get these awesome models. We offer free worldwide postage on orders of 75.00GBP or more otherwise a flat 5.00GBP shipping charge applies. Go HERE or read on and look at the fantastic pictures! 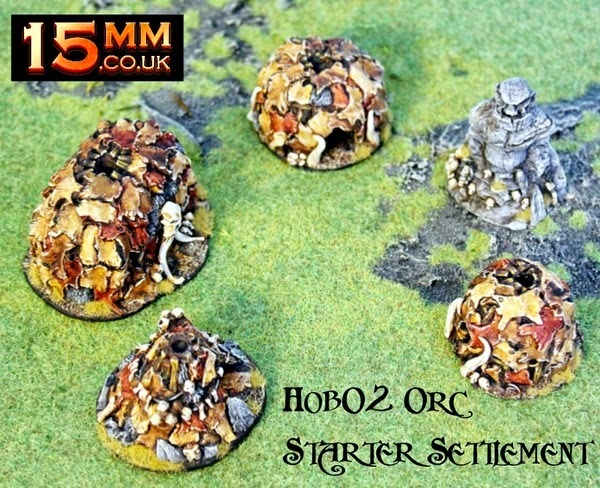 HOB2 Orc Starter Settlement (5 Buildings) – Save 15% to 20%! This set of high quality very detailed resin buildings contains five different 15mm scale single pieces. 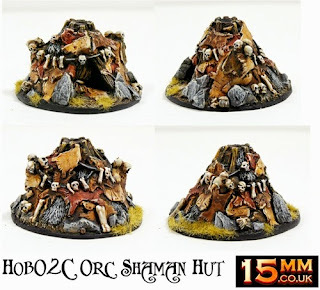 These give you an Orc Settlement which is suitable for any fantasy world and campaign. No assembly required. 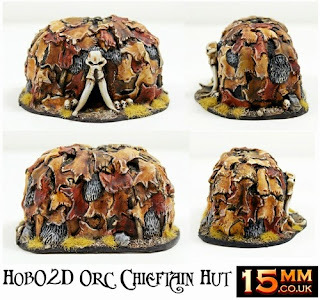 The set contains an Orc Hut I, an Orc Hut II, an Orc Shaman Hut, an Orc Chieftain Hut and an Orc Stone Idol. 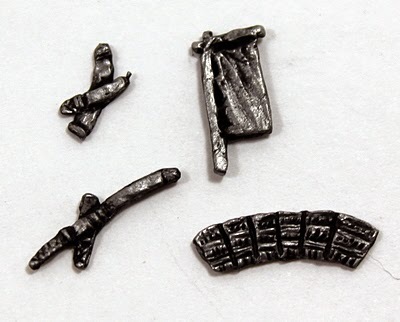 Every building is loaded with great little features and can be arranged in countless ways on your wargaming table. Total separate prices for purchase 24.00GBP starter set priced at 20.40GBP (15% saving). Buy three sets and save an additional 10% off list prices using the option in the drop down menu on the product page manually. This 15mm scale one piece highly detailed resin building requires no assembly. Suitable for any Orc campaign in a fantasy wargaming world it depicts the dwelling of those on the lowest rung of the housing ladder. A crudely assembled tent like structure covered in layers of animal (and other things!) skins. An open hole lets smoke out from cooking fires and two large tusks frame the doorway along with some rocks and human skulls. This building is 40mm across and 35mm tall. Price is 4.00GBP. This 15mm scale one piece highly detailed resin building requires no assembly. 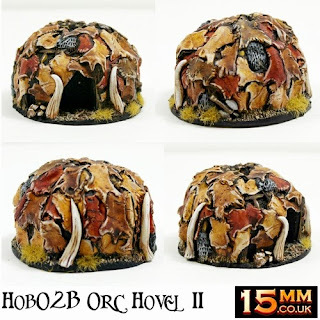 Suitable for any Orc campaign in a fantasy wargaming world it depicts the dwelling of those on the with a little more space. A crudely assembled tent like structure covered in layers of animal (and other things!) skins. An open hole lets smoke out from cooking fires and two large tusks frame the doorway and two more support the rear of the building along with some rocks and a smashed human rib cage. This building is 50mm across and 30mm tall. Price is 4.00GBP. This 15mm scale one piece highly detailed resin building requires no assembly. Suitable for any Orc campaign in a fantasy wargaming world it depicts the dwelling of those who practise magic in the name of the dung loving Orcish gods. A crudely assembled tent like structure covered in layers of animal (and other things!) skins. An open hole lets smoke out from cooking fires and its decorated with many human skulls and bones from other animals. Its door hanging is tied back. This building is 50mm across and 30mm tall. Price is 5.00GBP. This 15mm scale one piece highly detailed resin building requires no assembly. Suitable for any Orc campaign in a fantasy wargaming world it depicts the dwelling of the Orc that rule the tribe. A large and less crudely assembled tent like structure covered in layers of animal (and other things!) skins. An open hole lets smoke out from cooking fires and two large tusks and a skull frame the doorway along with some rocks and human skulls. 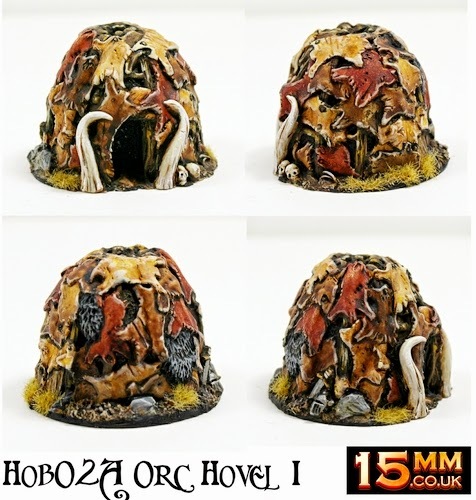 This building is 70mm wide, 40mm deep and 30mm tall. Price is 6.00GBP. 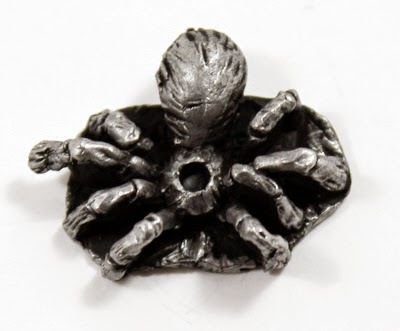 This 15mm scale one piece highly detailed resin structure that requires no assembly. 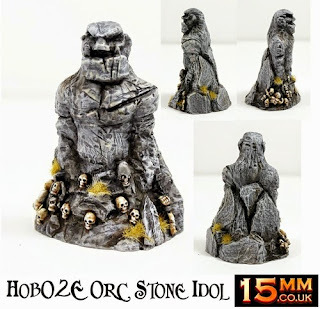 Suitable for any Orc campaign in a fantasy wargaming world it depicts a crudely carved stone idol decorated with human skulls and with the upper body and face of an Orcish minor deity. The idol is 40mm wide, 30mm deep and 70mm tall. Price is 5.00GBP. These buildings were designed and sculpted by Sam Croes and as well as being superb for wargaming they are also beautiful objects in their own right. 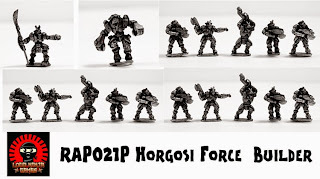 They are unlike anything I have seen in wargaming and just call out for painting and your affection. Enjoy the pre-order offer everyone! 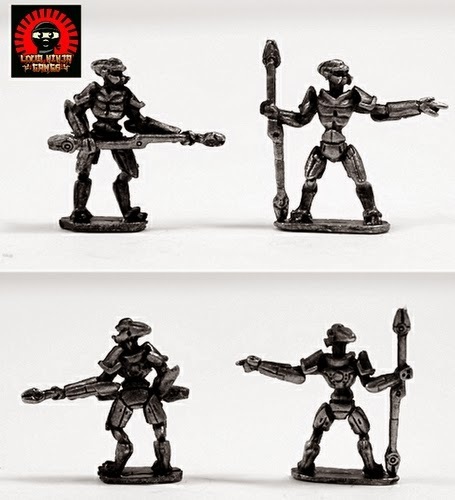 Remember we have the HOB01 Human Starter Settlement too which you can see HERE on our website. 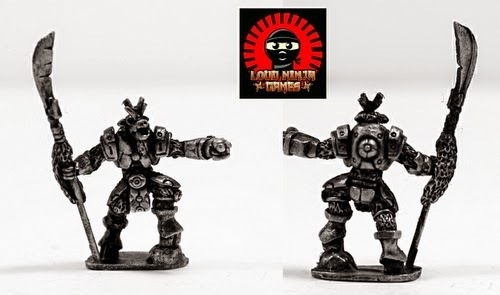 We also have Orcish Offers with 10% off Tabletop's Mountain Orc Warband as well as HOT Orcish Horde and Catapult with Orc Crew. Go to our DEALS and OFFERS page. Congratulations to Loud Ninja Games for today is the release day for the next big expansion to the RAP code structure with the arrival of The YanDrassi an alien empire made up of several distinct species. There are pack codes and force builder packs with a small saving. Find them on the Loud Ninja Games page. 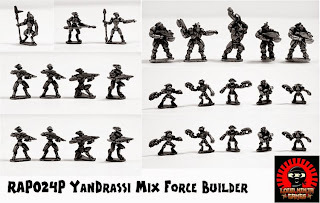 We have two blog posts as well one all about 'Who are the YanDrassi' and also 'Stijn's Painted YanDrassi' click through to see the pictures and read more. Designed by Sean Bullough these 15mm science fiction miniatures are great for any setting and campaign. Here is what is now on the website. 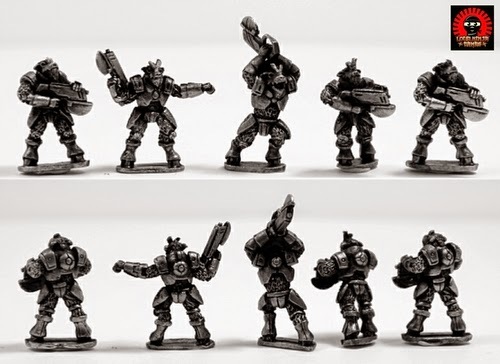 All the miniatures are 15mm scale and cast in high quality white metal. A whole army of troops and commanders can be had from these codes. Each of the following Force Builder Packs gives a whole force to use and gives you a 5% saving off the codes above in a bundle. 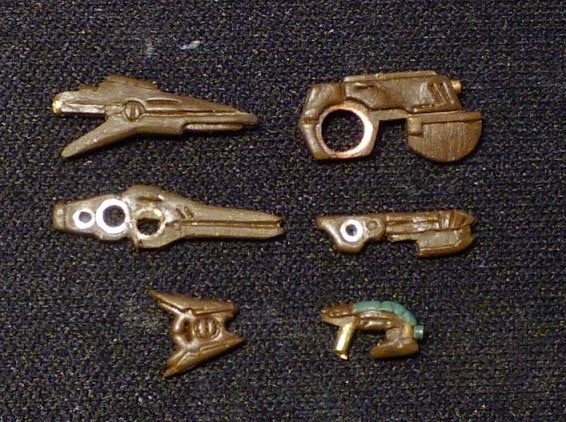 (1xRAP024, 1xRAP023, 1xRAP021, 2xRAP020, 2xRAP019) (26 Miniatures). 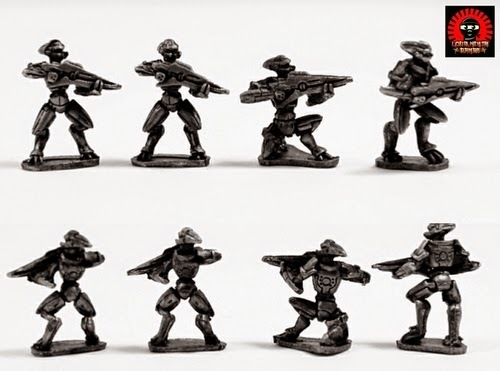 We all hope you really like these versatile miniatures and fit them to your own campaigns. Who are the YanDrassi from Loud Ninja Games? 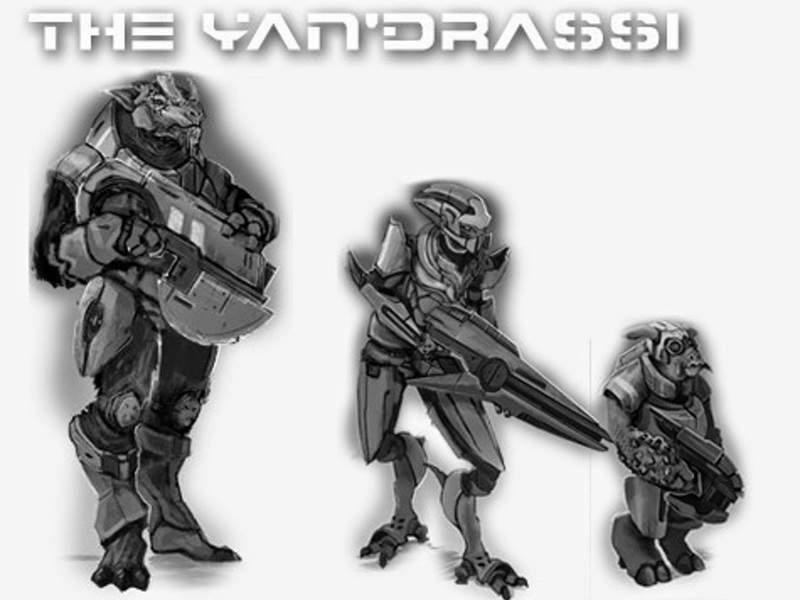 The Yan'drassi are collective of worlds all governed by the enigmatic and seldom (if ever) seen Yan. Each client race does its part to support the greater good of the Yan'drassi. Some do this through industrial, economic, or agricultural means while others have nothing but their own citizens to offer. These worlds with nothing of great value other then their people are those that make up the fighting arm of the Yan'drassi. The most commonly encountered species within the military orders are the Neeks, Tavshar, and Horgosi. Neeks are a diminutive planet-bound species of humanoids who were saved from catastrophic overpopulation by the Yan'drassi. They send countless numbers of their people into the stars to fight for the Yan'drassi. Being very simple creatures, they are the lowest rung of the military order providing ample cannon fodder. 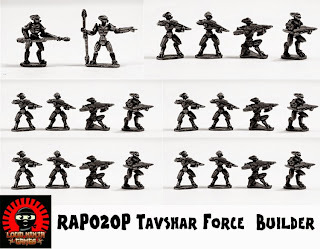 Tavshar are a warrior race who, while possessed of interstellar travel and their own collection of conquered worlds, recognized a greater opportunity for proving themselves in combat by joining the Yan'drassi military order. They are artful, martial, and precise providing the military orders with a core of elite soldiers and leaders for less capable troops like the Neeks. 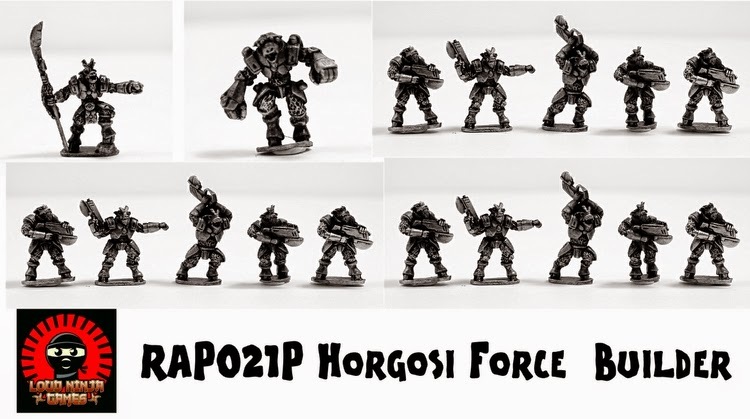 Horgosi hail from a rugged world where they exist in a pre-stellar herd culture. Horgosi males prove themselves through duels and physical feats. Joining the Yan'drassi military order saved them from being used as labor and provided them with new ways to prove themselves. 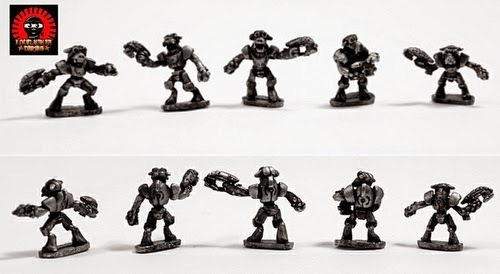 They are mostly used as assault troops. 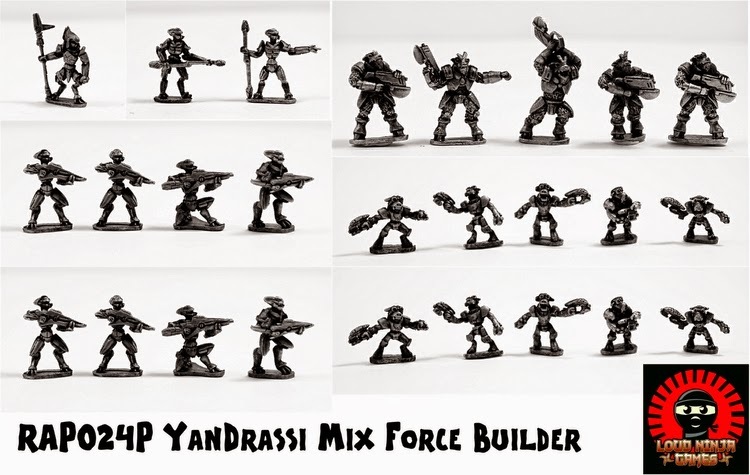 The second successful Kickstarter Campaign run by Eli Ardnt the man behind Loud Ninja Games created the YanDrassi Empire a mixed species force of alien miniatures for use in 15mm science fiction wargaming. This article sums up the information from the campaign along with images it used so that you can familiarise yourself with the ethos and ideas that became these great miniatures. 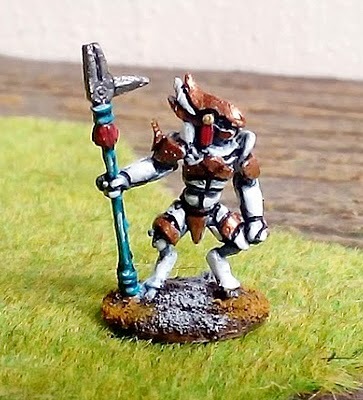 There is also a short blog post showing Stijn's painted YanDrassi which you can see HERE. 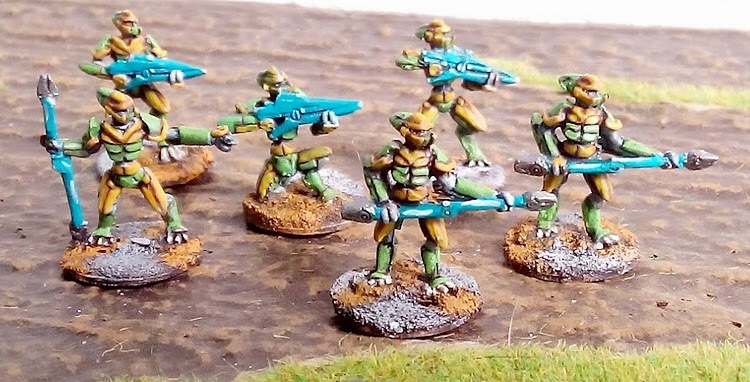 From the 5th of May 2015 this range is added to the Loud Ninja Games page on 15mm.co.uk where it joins the Chuhuac, Ikwen, Mutants and Alien Encounters in a growing collection. Packages full of YanDrassi miniatures went out all over the world from here in Scotland and one of them ended up in the hands of the talented Stijn Van der Jonckheyd. Stijn very kindly offered to let us show you all pictures of his painted and based YanDrassi. Here are the pictures with a short caption under each of them. 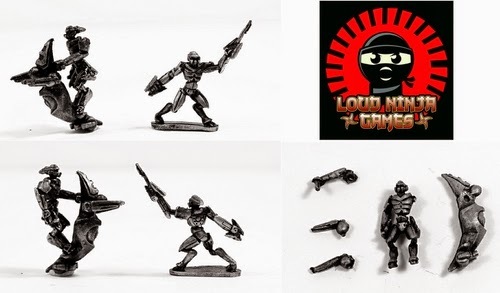 You can find the YanDrassi in the Loud Ninja Games range page on our website from 5th May 2015. Thanks for your time. Enjoy! May is a new month and while we had an epic time during April the work and the fun continues apace. Really it does, no rest for the awesome. 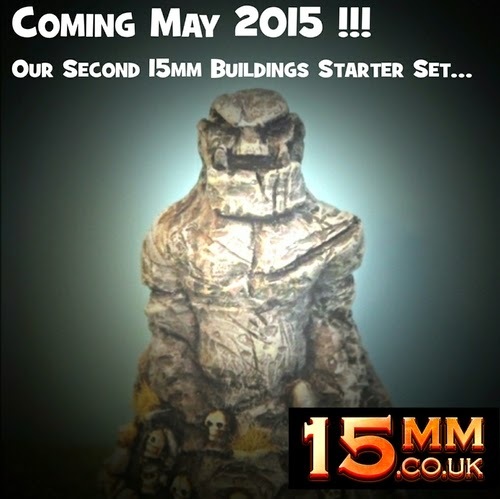 There are many new releases coming in May for 15mm.co.uk and these will be delivered weekly throughout the month. While we begin next week with 15mm science fiction from Loud Ninja Games (you all know what I am talking about don't make me Kickstart your brains!) 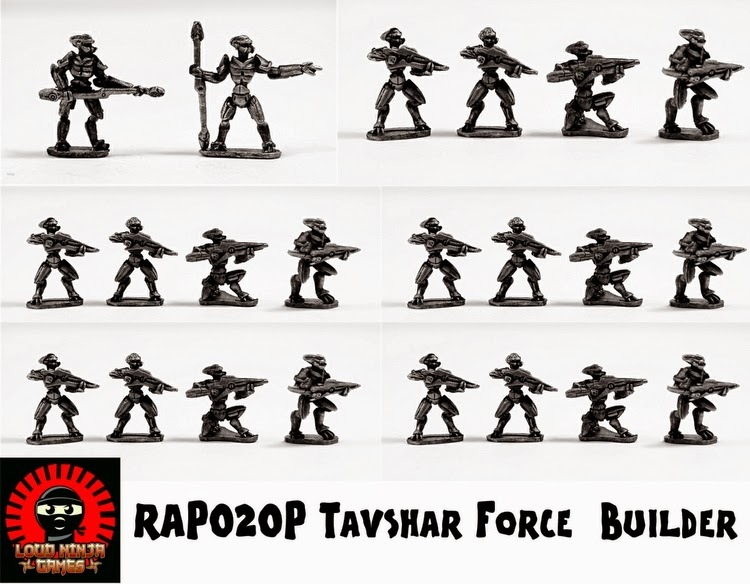 the following week will see the release of our second 15mm fantasy set of buildings. The image here is a little teaser of what is coming in less than fourteen days time. Have a ponder and rub your tusks and think if you prefer yours with brown or green skin. The second half of the month will be historical and SHM and also fantasy as well but more on that later. 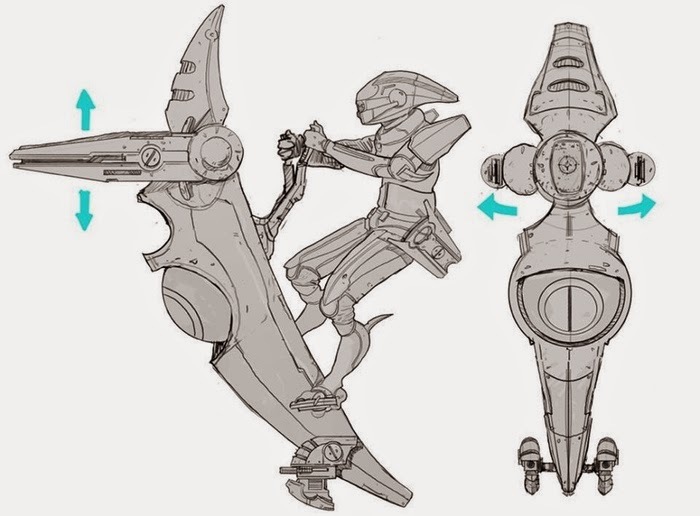 If you missed the HOB01 Human Starter Settlement then you can learn all about it by clicking through. We had a really nice response to this set of buildings sculpted by hand by Sam Croes and we are following up on it this month as promised. A set and singles too.